He never would have guessed it. 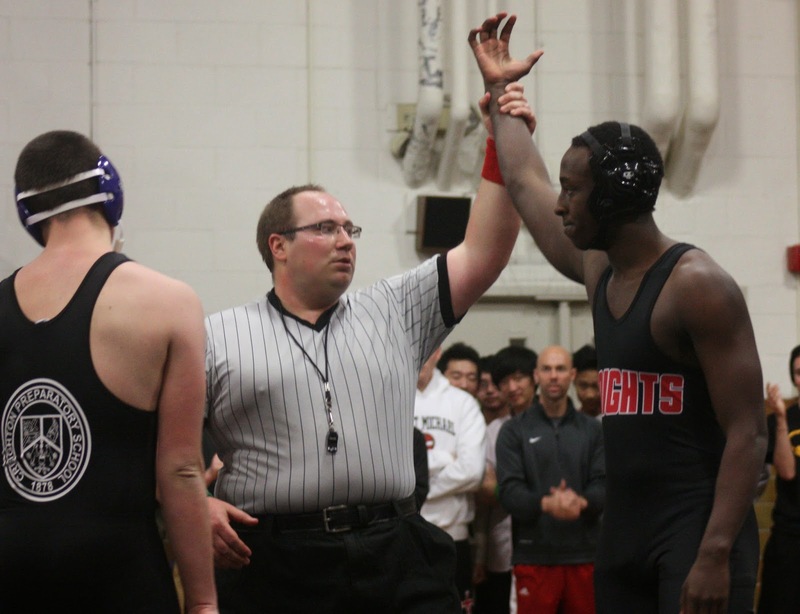 “I saw how hard wrestling was and I wanted to challenge myself,” senior David Uwinganji said. Throughout the past two years, Uwinganji has emerged as a leader for the Mount Michael wrestling team. Uwinganji now believes wrestling was the right fit all along. When Uwinganji attended his fi rst wrestling meet, he was introduced to its aggressive nature while watching his best friend, senior Austin Ramaekers. “I saw Austin struggling on the mats. It made me feel so bad that I wanted to run down the bleachers and go help him out,” Uwinganji said. Although he’d never thought about joining the team before, something about wrestling made his curiosity grow. “It seemed really unfamiliar to me at first, but I decided to give it a shot,” he said. Uwinganji’s interest was solidified during a conversation with Ramaeker’s grandmother. “Austin’s grandmother was a big motivator in my decision. She urged me to help out the team, and I am so happy with my decision,” Uwinganji said. A few days after his decision to join the team, he began to feel more confident about his choice. “I learned martial arts back when I lived in Rwanda which gave me the basic concepts to wrestling. I just needed to learn how to use my size, flexibility and strength in a different way,” Uwinganji said. However, success on the mats did not come immediately. He found himself doubling his work ethic in order to prepare for the season. “I would wrestle Connor Spiegel, a senior at the time, in order to push myself to become a better wrestler,” Uwinganji said. With the extra effort, Uwingaji soon found himself winning matches and becoming a threat to opponents. His fellow wrestlers appreciate his hard work. Senior teammate Austin Ramaekers says, “Wrestling with Uwinganji you know that he will never quit and he has a great work ethic. He always sets the tone at practice,” Ramaekers said. As a result of his love for wrestling, Uwinganji has become a leader and shares his passion to those who are new to the sport. “Being a leader and a captain means a lot to me. It shows that kids who are new to something can make it one of their best skills. Sure, I’m not perfect, but I love to help the team in any way I can,” Uwinganji said. Since the start of his third and final season, Uwinganji’s main goal is making it to state. “With coach and others pushing me to do my best, I have state on my mind every time I step onto the mats,” he said.